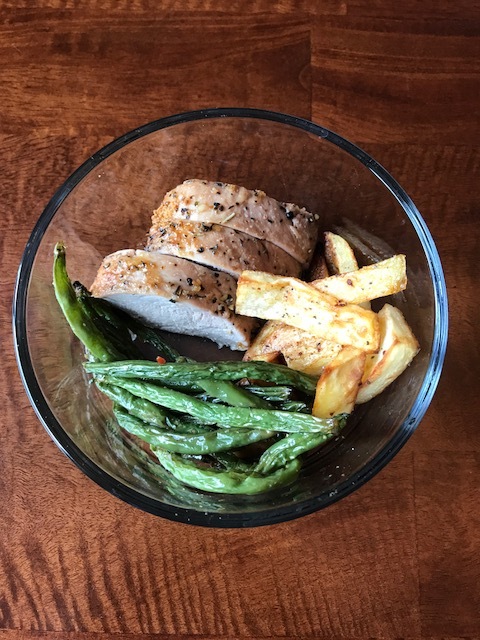 Our second day of cooking with the challenge and we’re making Pork Tenderloin and Green Beans Sheet Pan Supper. Let’s start with the potatoes if you are doing carbs. Heat the oven to 400. Get a sheet pan ready with foil and cooking spray. Cut the potatoes in half, then into wedges. You can use regular potatoes or sweet potatoes. 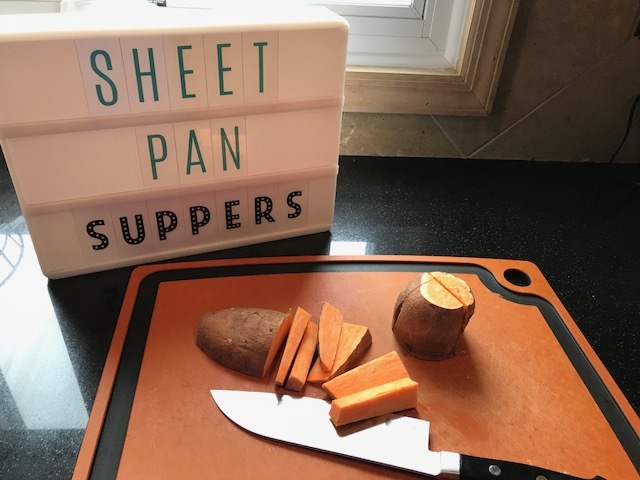 Note – sweet potatoes are hard to peel before cooking, but the peels very easily after roasting. 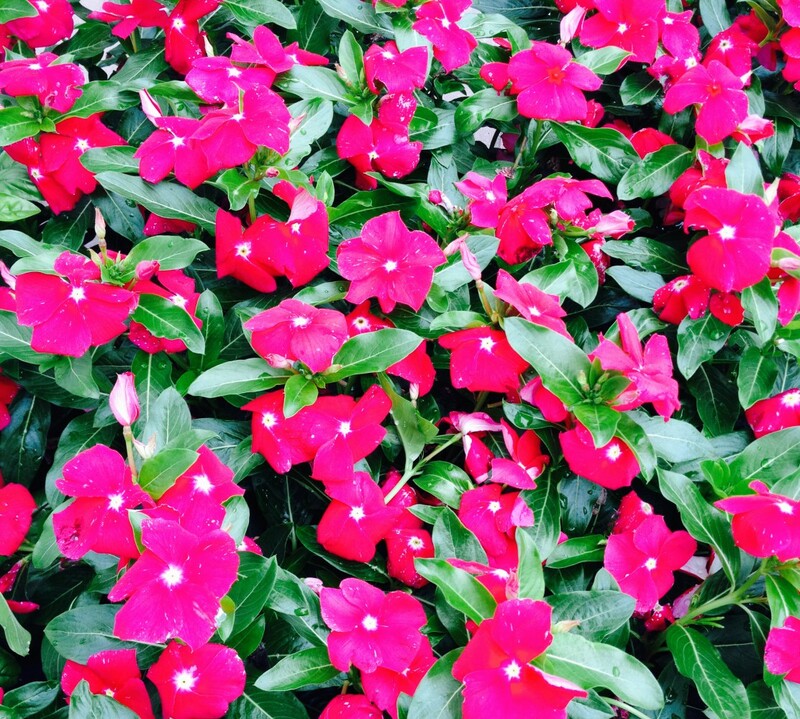 Cut off the ends, cut them in half, then each half in half, then into wedges. 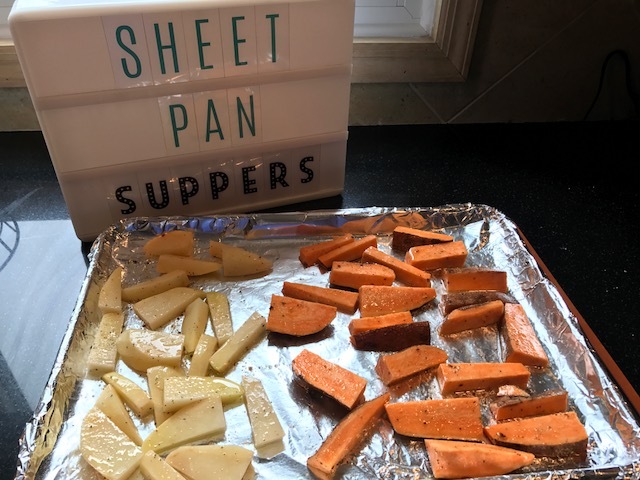 Place the wedges on the sheet pan. Drizzle with oil, sprinkle with salt and pepper. Drizzle your potatoes with oil, sprinkle with seasonings and toss on the pan to coat them. I am showing 2 kinds of potatoes – you choose what you like. Bake at 400 for about 40 minutes, until they are browned to your liking. Coat the pork with the sugar/spice mixture. Get another sheet pan ready with foil and cooking spray. Place the brown sugar and seasoning in a shallow dish. Sprinkle pork tenderloins with salt and pepper. (In this recipe I am making one and freezing the other for another time.) Coat with the sugar mixture and place on the pan. 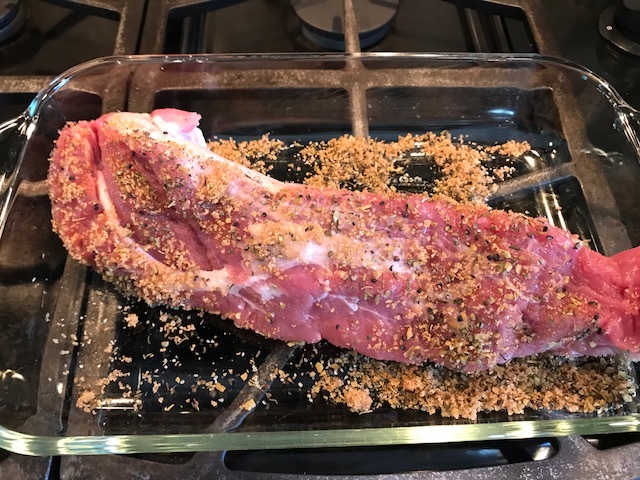 Place the pork tenderloin(s) on a greased sheet pan. 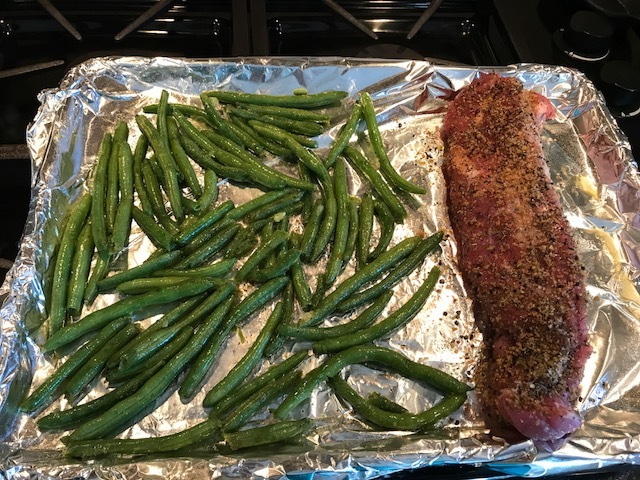 Make sure the green beans are dry, place them on the sheet pan and drizzle with oil then sprinkle with seasonings. Toss to coat the green beans. Put the pan in the oven for 20 – 30 minutes until pork is cooked to your liking. Remove from oven, place a piece of foil over the pork and let sit for 10 minutes before slicing. Slice the pork and put everything together. Package up the leftovers for lunches. Place brown sugar and seasoning in a shallow dish. Sprinkle salt and pepper on all sides of the pork. Coat the pork in the brown sugar seasoning. Place on baking sheet. Place green beans on other half of pan. Drizzle with oil, sprinkle with salt and pepper. Toss beans to coat them with seasoning. Bake at 400 for about 20 minutes, until the pork is cooked through. Let pork rest for 10 minutes. Heat oven to 400. Line another sheet pan with foil and spray with nonstick spray. Cut the sweet potato in half, then into wedges. Place the sweet potatoes on pan. Drizzle with oil and sprinkle with salt and pepper. Toss to coat the potatoes. Bake at 400 for about 40 minutes until soft. 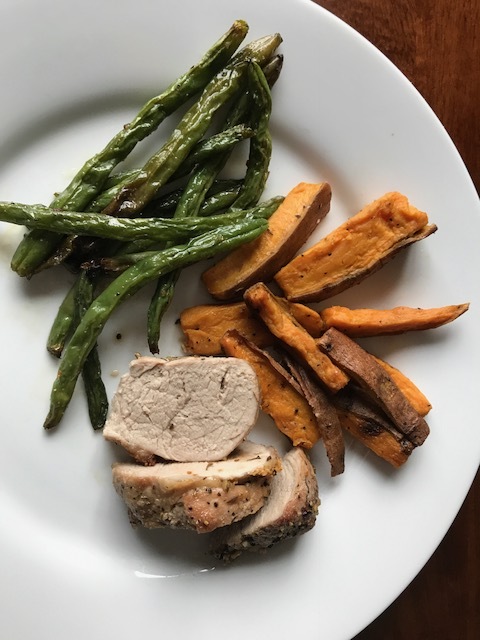 *TS Swaps: 1 tbsp Rustic Herb Seasoning. Seasoned Salt and Garlic Pepper to your preference.